It is a truth universally acknowledged that a Christian in possession of a Bible must be in want of some help in reading it. Bible reading notes were once the staple of any church which believed the Bible to be a vital resource for discipleship and growth, but like many habits, regular Bible reading and the use of notes to support that has been on a slow but steady decline over several years. 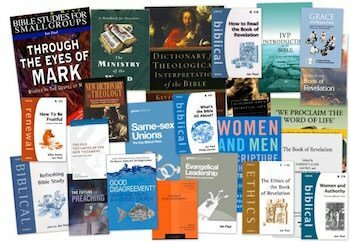 I write for Scripture Union’s Encounter with God and for BRF’s Guidelines, but there are many other resources available for people at every stage of faith. For those who find the daily discipline of reading on their own too demanding or unhelpful, the ‘lectionary’ of the Bible reading notes can offer a connection with others, and lead to shared discussion. Those who write these notes often work hard to whittle down key insights from commentators and their own thinking into short and digestible reflections that connect with everyday life. 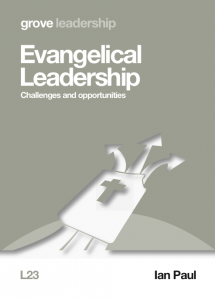 So they offer a great resource for study as well as for teaching and preaching. Are Bible reading notes promoted and provided in your church? If not, shouldn’t they be? I offer here some of the material I wrote on Mark’s gospel for EWG which subscribers are reading this week. And if you are in need of something else quite diverting, you can find here a complete hyperlinked text of Jane Austen’s Pride and Prejudice. The early chapters of Mark’s gospel took us on a breath-taking, roller-coaster ride through the early stages of Jesus’ ministry. We were offered summary accounts of a typical day in Jesus’ life, showing his dynamic power in preaching and healing, and the impact that he made. This included drawing crowds who longed to hear his teaching and receive his healing touch, but along with that the political and religious leaders who, feeling threatening by this new popular interest, began to plot against Jesus. This next stage of the story continues with some of the same themes, and builds on Mark’s first chapters. Once more we see Jesus acting with dynamic power; once more we see his teaching ‘with authority’ have its double effect; once more we see opposition growing even whilst the crowds swell. But the pace slows here; Mark offers us stories of particular individuals in some depth—and usually in much more detail than the parallel accounts in Matthew and Luke. He is at his masterful best in telling these stories—including vital eye-witness detail (usually thought to have come from his source, Peter), structuring his stories with careful craft, and always focussing on Jesus’ compassionate attention to individuals. We are given a picture of someone who is unflustered by the most disturbing of encounters, someone who responds with equal compassion to the rich and the poor, the powerful and the destitute, someone who will not rush by but will attend to the needs of those before him, and someone who freely shares his power and his mission with those who join him. But the cross casts its long shadow even in this first half of the gospel. John the Baptist’s fate foreshadows Jesus’ own destiny, and Jesus knows it. As we head towards the crucial turning-point of the gospel in chapter 8, Jesus is already aware of the bittersweet nature of the kingdom he proclaims—a kingdom which brings profound liberty to all who encounter it, but only at the cost of his own life. Despite being the shortest of the gospels, this is one of several stories that Mark tells us in great detail—longer than Luke, and much longer than Matthew’s summary version. It is full of vivid action and striking detail as it communicates Jesus’ mastery over the forces of chaos in this man’s life. There is some debate about exactly where the ‘Gerasenes’ are located—but the end of the story refers to the Decapolis, ten towns to the north-east of Galilee that were largely Gentile. As Jesus steps out of the boat, this wild man ‘immediately’ comes from the tombs—a word characteristic of this part of Mark. There has clearly been a lot of shouting going on; the man shouts at Jesus (verse 7) because Jesus has already been commanding the spirit to come out of him (verse 8). Mark paints a nightmarish picture of someone on the very edges of human existence. He lives in the tombs, a place of fear on the (physical and metaphorical) edge of society. He has a supernatural strength, and with his animal howling and self-harming, he must have barely looked human at all. In striking contrast to this wild, inhuman spectacle, Jesus appears to be in complete control. The man uses his name, perhaps as an attempt to wrest power from him, but Jesus demands to know the name of the spirit in return—Legion, suggesting the unwelcome occupation by an invading force. The spirit(s) recognise not only Jesus’ authority, but also their own status, epitomised by the unclean pigs. Jesus uses his power not as a demonstration, but for restoration—restoring the man to dignity (‘clothed’, verse 15), sanity (‘in his right mind’) and community (‘to your own people’ verse 19). 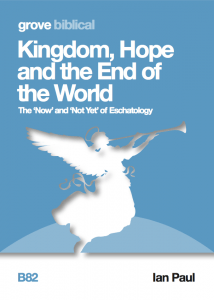 Yet the response is fear; the people are not prepared to accept Jesus’ reordering of their world. Reflection: Are there areas of your life which need this restoring power of Jesus? 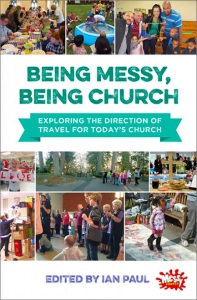 Are there areas of the life of your community which need Jesus’ reordering? Jesus once again ‘crosses’ the lake—not diagonally, as we might think, but across its northern section. Mark has a particular interest in boats, fishing and lake crossings, perhaps reflecting Peter’s perspective as a local fisherman. Of all the gospels, Mark does his theology primarily through telling his story. 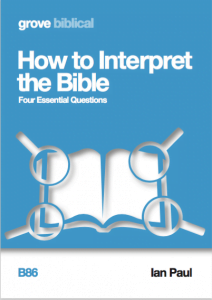 Here he interlocks two encounters with Jesus, and they have important points of connection. Both characters are desperate for Jesus’ help, and both share ’12 years’—the age of Jairus’ daughter (verse 42) and the time the woman had suffered (verse 25). But they mostly offer a study of contrasts. Jairus, a named man, is a person of means and influence. As synagogue leader, he had probably contributed financially to the community and was looked to for leadership. By contrast, the woman’s bleeding would have made her unclean and unable to participate in the life of the religious community. She has exhausted her financial resources, and Jesus is her last hope. The act of healing is not an exercise of magic, but of humanity. 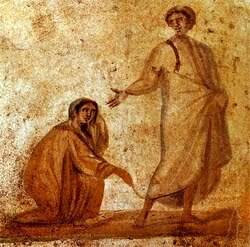 As the woman reaches out to touch Jesus, he senses the power leaving him. Healing was as costly for Jesus as it can be for us—it takes time, attention and energy, and he is willing to give all three to the woman. By commending her ‘faith’ (verse 34) he was not praising her for some attribute which qualified her to receive healing, but for her attitude of trust and willingness to receive what only he could give. Recognising her own poverty allowed her to receive her inheritance of healing (compare Matt 5.3). The final contrast is not with Jairus, but with the disciples and (as Luke 8.45 tells us, though Mark disguises this) with Peter. They are sceptical about his insight, and slow to see his power to heal. Reflection: How might we better offer the hope of Jesus’ healing to the full range of people around us—the resourceful and the exhausted? Are you living within this hope today? The delay in Jesus’ journey is reminiscent of his delay in John 11 in going to the home of his friend Lazarus. The story continues with its sharp contrasts between faith and unbelief. Messengers come ‘from the synagogue ruler’, but since Jairus is with Jesus and is addressed by them, this must mean they have come from his house. Jesus is referred to as ‘the teacher’, a translation of ‘Rabbi’ (compare John 1.38); by this point in Mark his status is now widely recognised. He either ‘overhears’ what they say (it is not addressed to him) or he ‘overlooks’ ie ignores it. Trusting Jesus, even in the face of death, offers an alternative to the stark reality of the news that has been brought. Jesus not only encourages faith, he also clears away anything that would reduce faith. So he goes on only with the inner circle of his disciples—Peter, James and John. By the time they arrive at Jairus’ house, there is already quite a crowd. As an important figure in the community, Jairus’ misfortune will have drawn many people from the town, and that would include a sizeable entourage of professional mourners, paid to wail and grieve with friends and family. Jesus’ reordering of the world has previously provoked fear, but now it draws mocking laughter of unbelief—so Jesus puts them away too. Neither questioning doubt nor mocking cynicism can be allowed to puncture faith. Mark alone records Jesus’ actual words in Aramaic to her. There is no drama or fanfare—simply clear evidence of Jesus’ miraculous power. Whilst even the inner circle are astonished at what they have seen, Jesus’ concern is with the girl. She is to be given something to eat, and no-one is to be told. The family are recipients of a gift of grace, not performers in a miracle show. Reflection: What are the things that have, over time, sapped or undermined your faith? How might you leave those things behind and focus on God’s promises to you? I suspect much of the decline is due to the changing shape of western life in general. Other observations such as perceived disconnect between the scriptures and real life have probably been around for centuries or more. Bible reading is mostly relatively recent. Various forms of bible memorisations must have a longer history. What groups of folk really need are living examples of people living in God’s ways in the nitty gritty of life. Folk that show the ‘how’ worked out in practice. For starters, somebody, some group, that embody the restored life and community- outside of organised meetings. 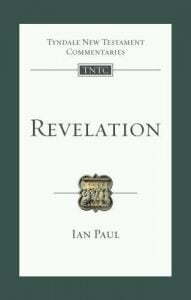 I am currently reading Ian’s comments in “Encounter with God”, and finding them very useful. Bible reading notes that simply regurgitate the plot of the passage (not you, Ian, but this is surprisingly frequent) are not so good. I do feel I need professional notes, but I do also believe in reading the Bible on your own, by your own plan. Even Bible reading notes occasionally miss bits out!! Bible reading notes that simply regurgitate the plot of the passage (not you, Ian, but this is surprisingly frequent) are not so good. I find even so-called study Bibles (seem to) do this! Initially, my personal issue with bible reading notes was that they became “guilt inducing notes”. Having given them up, I am free to enjoy the rare times I have to spend with the bible. The second issue that I had with them, and since I’m several years out of date, this might not still be true, was that they were often horribly simplistic and platitudinous. When I read the bible now, God speaks to me through it, whereas then, God had to speak through the medium of the note-writer, thus diluting the revelation. Let me put it another way. It’s stressful to have to listen to two people talking at the same time. That applies even when the two people are God and the commentator. The danger is that we skim read the passage so that we can get on to the really important notes, so the notes usurp the position of the Bible as the thing we should read. Those who have been involved in encouraging and resourcing personal Bible reading see the reasons for the decline as complex. In general life has moved towards fluidity rather than discipline and structure. Short term gratification rather than long term graft is the order of the day. There is less pressure to conform to accepted norms. Pressures of life mean that less time is available (or at least this is the perception). Statistics on reading are inconclusive, but probably there has been an overall decline. The church has reflected this to some degree. Renewal has brought great benefits but the slog of daily Bible reading is not quite as exciting as exuberant corporate worship. There has been an emphasis on the corporate rather than the individual, which in itself is no bad thing. Christian growth has become the province of the sermon and the small group. Bible reading has come to be seen as a duty which is deemed to undermine grace. To some extent there has been a desire to experience the new, and regular personal Bible reading reflects the past. Reversing this trend will be a challenge. Some may not even see it as desirable. But part of the answer may be in asking why we read the Bible. If we see it as primarily for information we face an uphill battle; there may more mileage in helping people to see it as a means of knowing God better, of becoming more Christ-like and being better equipped for Christian service we may change the mindset. Readers need to find it enjoyable and see the benefits and that is where a well written note can make such a difference. So our thanks are due to Ian and those like him who work hard at bringing the text to life for the reader and applying it to contemporary life. I was reflecting on this early this morning. On three or four occasions in the last 60 years, God the Holy Spirit has spoken directly through one or several verses, read alongside Scripture Union notes, as well as verses given me by ‘encouragers’. Other times I hope the “short term gratification rather than long term graft” that has been the order of most days has guided my life and kept me out of prison, literal or the deadening prison of guilt. I have before me a copy of the Sept/Oct 1958 Key Notes by Montague Goodman which have fallen out of an old Bible given to me by a godfather on my 7th birthday, I am afraid they don’t show much sign of being heavily thumbed. Some years I fell out of reading S.U. notes, but most years appreciated my guides, some inevitably more relevant to me than others. That they are a good mix of insights from different cultures is an extra bonus in our fragmented world. The long term graft of working through, say John Stott’s Cross of Christ is of course essential for any half-serious disciple. The longer article that comes with each ‘Encounter with God’ is usually thought-provoking. Thank you for the opportunity to say ‘thank-you’ to Scripture Union. 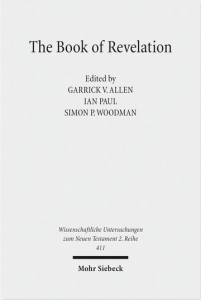 If you have never used Alan Stibbs “Search the Scriptures” it is to be recommended, taking you through the whole bible a bit at a time in only three years – when a student it was used with a commentary – this is part of the work at it, choosing to stick with God that has helped sustain and deepen my faith in God. Might be time to return to it for another three year cycle.